The earliest authentic record of Kolar Gold Fields is found in a report in the Asiatic Journal of 1804 of Lieutenant John Warren of His Majesty’s 33rd regiment. In 1850, an Irish Soldier, named Michael F. Lavelle, from Bangalore Cantonment, who had served in the regiment that fought against Tippu Sultan in Srirangapatnam, near Mysore heard about some native mines in a place named Kolar some distance from Bangalore. Being retired from active military duty, he decided to explore the Kolar region and see for himself if the information was true. On reaching the place, he was convinced about the presence of gold and decided therefore to hunt for gold and other precious metals himself. Accordingly, he applied to the Mysore British Government for prospecting Rights. In 1873, M F Lavelle obtained exclusive prospecting rights for mining coal and other metals for a period of 20 years. He began mining operations by sinking his first shaft near Urigaum / Worigaum (Oorgaum). The mining permission was the right to mine in Kolar extending over twenty years, at a royalty of ten per cent on all metals and metallic ores, and of twenty per cent on all precious stones. In 1880, The Gold Fields of Mysore Company, contacted a British Engineering firm known as John Taylor and Sons to mine for gold in KGF on their behalf. 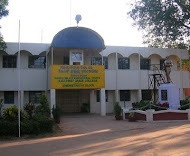 The John Taylor and Sons Company which were instrumental in striking gold in Africa, arrived in Kolar Gold Fields and began to prospect for gold in the Marikuppam and Oorigaum region. In 1885, the KGF Gymkhana Club was established by the British with a 12 Hole Golf Course and a Beautiful Victorian Club House. The Club House was equipped with a traditional bar, a library, a ballroom with a sprung floor, snooker and billiard rooms and tennis courts, which were all built and completed in a period of just six months. This Club was the first club to be established in KGF and is ranked as the 4th oldest Golf Club in India. 1894: T he Mysore Government under the British, financed the construction of a branch railway line, 10 miles long connecting all the five mines between Mysore Mine (Marikuppam) and Bowringpet Junction (Bangarpet) to connect KGF to the Bangalore Madras Railway line. In late 1890’s, the John Taylor and Sons Company with the assistance of Dr T J O’Donnell and J D O’Donnell, established a well equipped 80 Bed hospital to cater to the medical needs and emergencies of the miners and their families. It was centrally located in Champion Reefs. Dr T J O’Donnell was the first Chief Medical Officer of the Hospital and served as the CMO for more than 25 years. September 1899 The Kolar Gold Fields Sanitary Board was constituted in September 1899 with three ex-officio members and four non-official members nominated by the Mining Board. In 1902, the Mysore government established the first major hydro-electric generating station for commercial operations at Shivanasamudram. The longest transmission line, at the highest voltage in the world, was constructed to meet the power needs of mining operations at KGF. The erstwhile Mysore State became the first state in India to establish such a huge hydro-electric plant and KGF was the first town to get hydro-electric power. Also in 1902, the township of Robertsonpet was established to house the Kolar Gold Mines related tertiary sector populace. It was named as ‘Robertsonpet’ by the then Maharaja of Mysore, in commemoration of the memory of Sir Donald Robertson, who was the British Resident of Mysore and who was also responsible for launching the first Hydro-electric plant in Shivanasamudram which supplied electric power to the KGF mines. Several trades people such as manufacturers, bakers, printers, confectioners, contractors, printers, outfitters, timber merchants, jewelers, haberdashers, pawn brokers, etc set up their business in the town of Robertsonpet. In 1903, the Mysore British Government constructed a huge man-made lake in Bethamangala (a small town about 5 miles away from KGF and the underground water source of the Pala River) to supply filtered drinking water to KGF and the surrounding townships through huge pipelines from the Government Water Works at Bethamangala, Soon Bethamangala became a popular sailing and picnic spot for the British population in KGF. In the 1920s, when the mining industry was at its peak, KGF occupied 30 square miles and had a population of 90,000. The mines had an impressive 24,000 employees working in various capacities. Out of this number, around 400 were Europeans who held most of the high positions, around 650 were Anglo- Indians who held middle management posts such as supervisors, team heads, etc. The rest of the 23, 000 work force, comprised Tamil and Telugu speaking labourers and workmen, supervisors and Maistries. The Champion Reefs Mine was more than 12000 feet deep and was / is the second deepest gold mine in the world. It was the first town in India, which had electricity supplied to it from a captive power plant, good water supply, well-equipped hospitals, schools, etc. In the mid 1940’s, Trade and Labour Unions came into existence almost overnight under the leadership of leaders like V.M. Govindan, K.S. Vasan, M.C. Narasimhan and others. This marked the beginning of one of the most vibrant Trade Union Movements in India. On 28th November 1956, the KGF Mines were ultimately nationalized by the Government of India. The social and economic structure of the Kolar Gold Mines changed after this. Mining went on as usual in KGF after the exit of the John Taylor and Sons Company. The Mining Industry was now solely in the hands of the Government of India. Even though most of the gold reserves were now depleted after being mined for almost a century, the mines still yielded some gold. However, the pathetic conditions of the workers remained the same with little or no improvement in their working or living conditions. In 1972 , the KGF mines, were renamed as the Kolar Gold Mines Undertaking Limited. It was made into a Public Sector Undertaking under the Department of Mines, and the name was later changed to the Bharat Gold Mines Limited. By 1990’s due to the heavy costs involved in mining and with the gold reserves depleting rapidly, the Bharat Gold Mines Ltd Company incurred heavy losses. By 1992, the Company’s accumulated losses were over Rs.502 Crores and went before the Board of Industrial and Financial Reconstruction. In 1980, the Kolar Gold Mines which produced more than 1000 tonnes of gold during its glorious days, celebrated its centenary. After just 40 years of Government ownership and management, the once vibrant Mining Industry was facing a severe financial crisis. 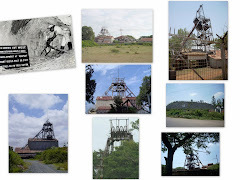 On 28th February 2001, The Government of India officially closed the KGF Mines and Mining operations came to an end after more than 125 years. With it one of the most famous Gold Mines in the history of the world came to an end. It was the end of an era in gold mining operations. The Company was not in a position to settle the dues of the miners as the case was pending before the Board of Industrial and Financial Reconstruction and it took a number of years before their dues were finally paid a couple of years ago. 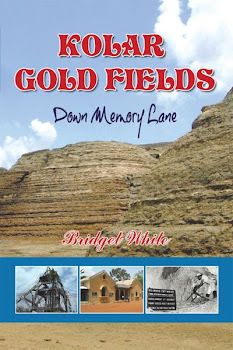 A vivid picture of an one-time glory KGF.The author's love for this goldensite is seen in every word. I am doing some family history research and have found an ancestral relative who was working as an overseer in the Mysore goldfields. My name is also Bridget and I would love to hear from you. Great article. Thankyou for your research. Are you able to contact me via email? I have a question I'd like to ask about an ancestor who worked on the Mysore goldfields. Re how to research for documents, information on him. Prefer to communicate via email. I am hoping to communicate via email. I have a question about an ancestor who worked on the Mysore Goldfields. We also have ancestors by the name White in India. Common name so probably a coincidence...?